Some of you may have seen it in salads along with other greens, and it’s also sauteed as a side dish in many Italian homes (it’s thought to be native to Italy). 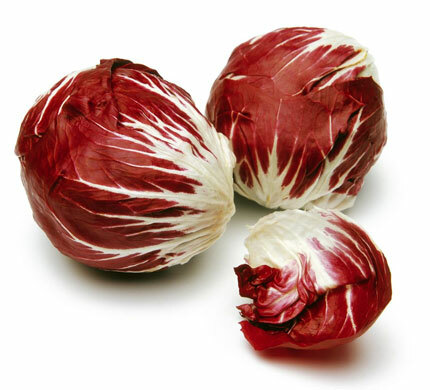 Radicchio provides 9 calories per cup, 0 g fat, 1 g protein and 2 g of carbs and a good source of dietary fiber, vitamin C, B6, E, iron, magnesium, zinc and phosphorous among other vitamins and minerals. The antioxidant content in radicchio is higher than in both spinach and blueberries and is highly nutritious. Try this recipe the next time you are cooking! Coat medium saute pan with nonstick spray, saute onion and cook, for about 1 minute. add radicchio, tarragon, salt and pepper. Stir, reduce heat, and cover with a lid. Cook for about 15 minutes, stirring occasionally so the vegetables don’t burn. Add broth to the radicchio, cover and cook for an additional 15-20 minutes, until tender. Remove cover, cook for a few more minutes to reduce and thicken the liquid. Re-season if needed with pepper and garnish with cheese and walnuts (optional). Provides about 130 calories per serving, 17 g carbs, 6.5 g protein and 3 g fat (0.1 g if omitting walnuts).